Kids, if you can dream it, you can be it, because, in this post-Gaga age, you were "born this way," and that's okay. Or is it? Well, apparently, if you're famous and have weird hair or piercings, maybe not. In that case, your style decisions are subject to plenty of scrutiny and on-the-fly commentary via a variety of social and traditional media channels. 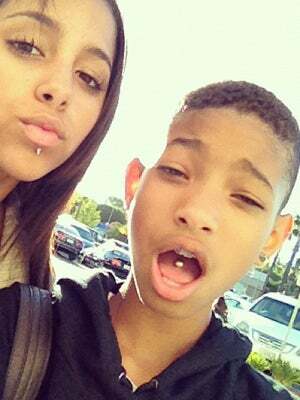 Case in point: When Willow Smith posted a picture on her Instagram of a tongue ring (which was fake), the Internet exploded. Comments flooded her Instagram, with users insulting her style, her parents, and her upbringing. This isn't the first time Willow has been exposed to this type of vitriol — when she debuted her freshly shorn head, parent blogs went nuts, and for a while now, her red carpet style has been criticized as too aggressive and overly punk. Fortunately, the irony of celebrating a child's individuality in theory and squashing it in practice has not been lost on the child of Will and Jada. She tells MTV, "Grown ups [have] children and they say you can be whatever you want to be. And then they go on my Instagram and comment, 'How can your parents let you go out looking like that?' Telling me that I can’t do what I want to do. When I’m someone’s child. You’re telling your kid they can be this but telling me I can’t be that."